Complete Streets policies and designs promote infrastructure that better supports the complex mix of transportation modes and users found in the transportation system. In part a reaction to car-dominated planning and engineering found across the U.S. in the post-WWII period, Complete Streets projects work to promote safe, economically vibrant, and active communities through expanded transportation choices and placemaking. 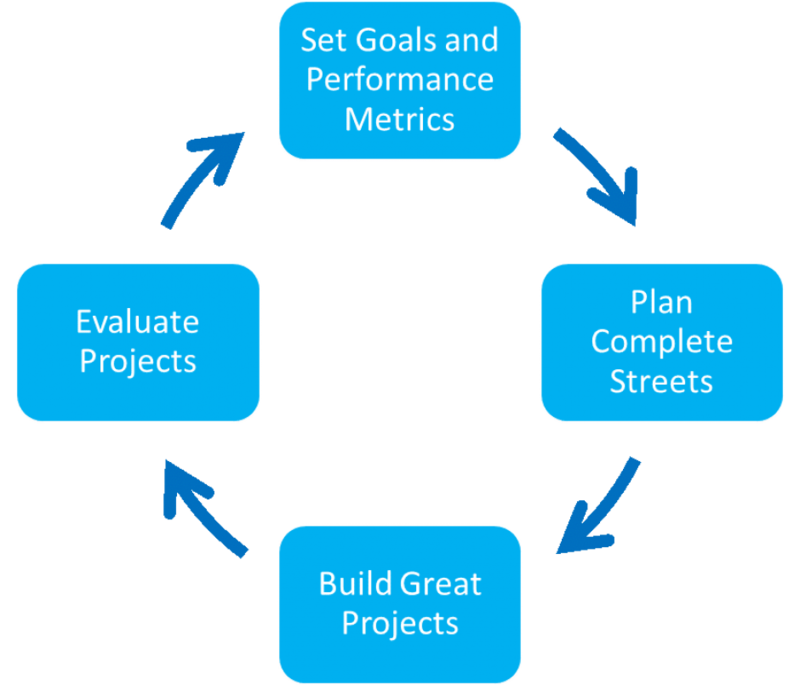 Complete Streets start at the policy level with the identification of community goals in the long-range planning process, including identifying measurements of success. These policies should span all departments and functions within a city or county, from engineering, planning, and maintenance to finance and enforcement. The policies and goals should set the framework for local planning and development efforts. Complete Streets should be included in specific plans, redevelopment activities, and system network planning. Community engagement is vital throughout the cycle, and is definitely important at the planning stage. Once planned, supportive design standards, adequate funding for implementation, and a maintenance and operations strategy will enable Complete Streets to take shape in a community. Starting small and tackling easier projects with community engagement can build momentum for more challenging implementations. An informal evaluation process will always occur by the local community’s public opinion, but evaluating projects after they have been implemented should also be a formal process conducted by the jurisdiction’s planners and engineers. Document what worked and what could be improved. Use this evaluation to see whether community goals are being met, additional Complete Streets policies are needed, measurements of success need to be refined. This project was funded in part by a Sustainable Communities Planning Grant from the California Strategic Growth Council. The following section answers common questions and provides resources for this step in the Complete Streets cycle. I have roadway design standards. Other than to meet the requirements of the California Complete Streets Act (AB 1358), why do I need a Complete Streets policy? What are my options if I don’t have room/right-of-way to accommodate all users on my roadways? Which projects will best compete for state and local Complete Streets funding? Level of Service (LOS) standards restrict my ability to make Complete Streets. With SB 743 shifting the metrics from LOS to vehicle miles traveled (VMT), how can I tell if my streets are performing well? What should I be measuring?